More than 150 agricultural influencers came together for the 2018 4R Technology Review Field Day at Kellogg Farms, a Blanchard River Demonstration Farm located in Hardin County. 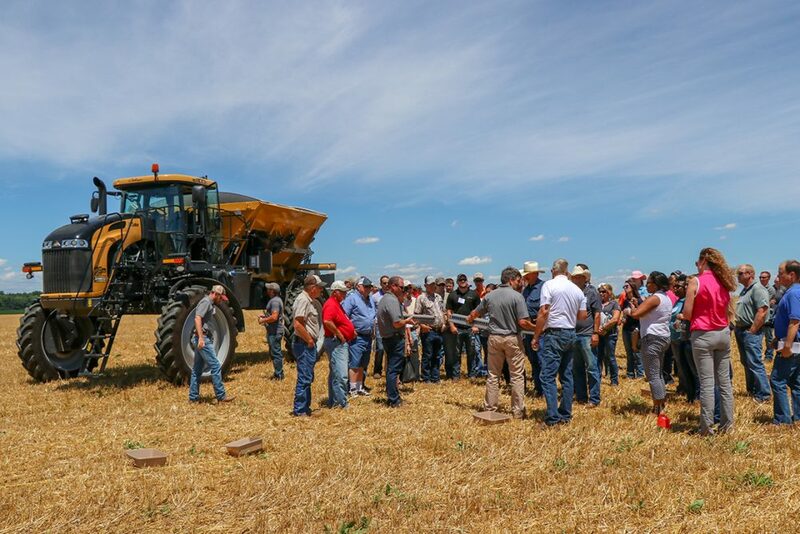 Agricultural retailers, researchers, farmers and others were in attendance to discuss the latest research on nutrient management, water quality, conservation efforts, and experience field demonstrations. Steve Culman, The Ohio State University, presented new Tri-State Fertilizer Recommendations, based on four years of research. Jeff Hattey, OSU, introduced On-Field Ohio, an online assessment tool to help farmers make decisions about best management practices. Hattey also shared an updated Phosphorus Risk Index, based on extensive edge-of-field research by Dr. Elizabeth Dayton. Lindsay Pease, USDA-ARS, shared goals and current project results of continuous edge of field water runoff monitoring. Glen Arnold, OSU Extension, shared drag line research findings from manure nutrient application in Ohio. All presenters stressed the importance of the 4Rs, which refers to using the Right Source of Nutrients at the Right Rate and Right Time in the Right Place. Attendees can evaluate and consider implementation of new techniques and best management practices into current conservation efforts. Attendees also heard from a panel of the Blanchard River Demonstration Network farmers: Bill Kellogg, Kellogg Farms; Chris Kurt, Kurt Farms; and Duane Stateler, Stateler Family Farms. The farmers shared conservation practices used on their farms with the goal of retaining nutrients, reducing runoff, and improving water quality. Hosted by the Ohio AgriBusiness Association, the event received generous support from industry partners, including: AgCredit, Blanchard River Demonstration Farms Network, Environmental Tillage Systems, The Fertilizer Institute, Mosaic, New Leader, Nutrient Stewardship Council, Ohio Corn & Wheat Growers Association, Ohio Farm Bureau and Ohio Soybean Council. The agriculture industry remains committed to improving water quality, retaining nutrients where they are needed, and reducing runoff into Lake Erie and other waterways in Ohio. Events like the 4R Technology Review Field Day provide opportunity to share current research and technology to continuously strengthen that commitment. Click here to view the event photos on the Ohio AgriBusiness Association’s Facebook page.